” Addressing the social disadvantage plaguing our communities is critical to solving many of the challenges facing our peoples, including suicide. It is critical to realizing the human rights of Aboriginal and Torres Strait Islander peoples. Our nation must face up to the devastation that has been wrought upon our peoples and which overwhelms us today. The worst response to suicide within Aboriginal and Torres Strait Islander communities is to ignore social disadvantage and instead attribute the loss of life to individual failure or weakness. “Addressing the social disadvantage plaguing our communities is critical to solving many of the challenges facing our peoples, including suicide. “Our nation must face up to the devastation that has been wrought upon our peoples and which overwhelms us today,” according to the Aboriginal and Torres Strait Islander Social Justice Commissioner, June Oscar. “The colonisation of our country has come at a great cost for our peoples. We see it everyday in the health and wellbeing of our peoples, in the lack of jobs and in the trauma and disadvantage that surrounds us. “We see the cost in the eyes of our children who have come to expect this life of pain, of interaction with the care and justice systems, drugs, alcohol and little hope that things will change. “We must work to challenge the view that somehow our position in society is simply because of our failure or weakness as individuals. Addressing the National Suicide Prevention Conference on 27 July 2017, Commissioner Oscar said the words of colleague Richard Weston are helpful in this context. “Richard said earlier this year that it’s not about trying to have a debate in this country about blame or guilt for non-Aboriginal people, it’s really just trying to understand how we got to where we are. Commissioner Oscar said suicide prevention strategies should acknowledge and build on relationships, culture, resilience and respect. “These are key to our existence as Aboriginal and Torres Strait Islander people. Our culture is both an ancient and continuing source of resilience. And it is a necessary part of the solutions that we are forging in our communities right across this country. “Research tells us that strong cultural connections are a necessary ingredient for good health and wellbeing. Of course we already know this but we need to build the evidence base around what works. “Our culture is the inspiration behind the therapeutic economies giving hope to our women in the Kimberley. “Similar initiatives exist across the country and we are finding new and innovative ways to broach this difficult subject. I want to acknowledge the work of Walpiri elders for trying to find a way to reach and reconnect with their young people through the development of the Kurdiji App. I look forward to seeing what other creative solutions our people come up with to tackle this important issue. This is the cultural medicine that our people need. “We also know that bringing about change means moving away from discussions that are based in the ‘deficit’ and channelling our efforts into the strengths-based programs and services such as those that I have already mentioned. “The language of strength, not deficit is what will keep our cultures and our communities alive. “We need to shift how Aboriginal and Torres Strait Islander peoples are able to participate in Australian society. Leading Aboriginal and Torres Strait Islander people involved in tackling suicide have received Australian Government scholarships to enable them to attend this week’s National Suicide Prevention Conference. Minister for Indigenous Health, Ken Wyatt AM, said their participation would provide important perspectives and contribute to the knowledge shared at the event, to be hosted in Brisbane by Suicide Prevention Australia (SPA) from 26-29 July. “Sharing ideas, experiences and bringing together people involved in suicide prevention and those with lived experience is crucial to finding the best ways forward,” Minister Wyatt said. “The Turnbull Government is pleased to sponsor both the conference and the indigenous participants. Approximately 400 people, including 11 scholarship recipients, are expected at the conference, which has the theme “Relationships, resilience and respect: Responding to vulnerability in life”. 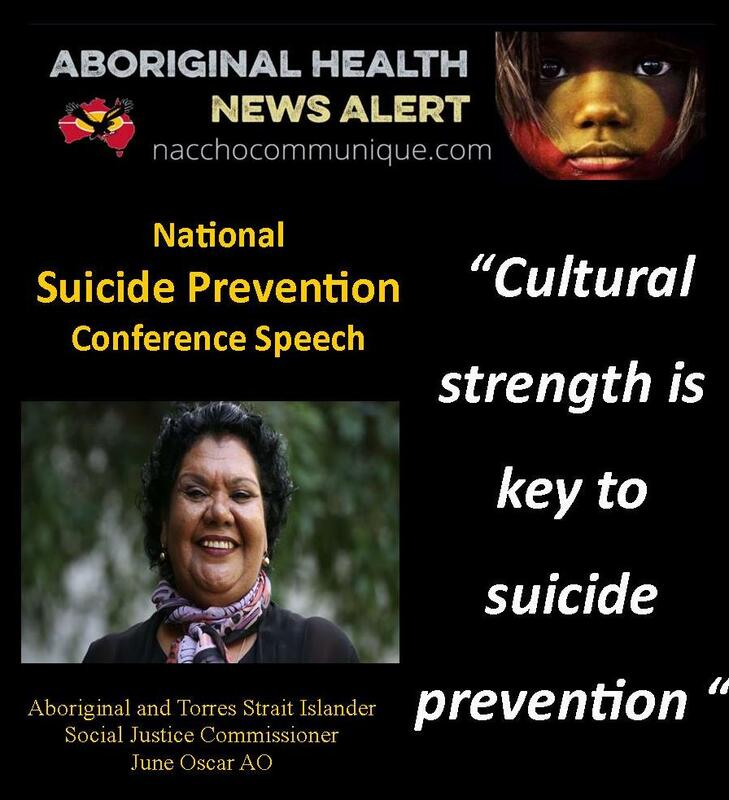 The conference aims to increase the profile of indigenous suicide prevention, with a focus on learning from programs featured in the Aboriginal and Torres Strait Islander Suicide Prevention Evaluation Project. “The conference will complement the Turnbull Government’s $34 million commitment to 12 national suicide prevention trials, which will gather evidence on better suicide prevention in regional areas of Australia, particularly in high-risk populations” Minister Wyatt said. Specific areas of focus for the trials include Indigenous communities in the Kimberley and Darwin regions and former Defence Force members in Townsville. Yaningi warangira ngindaji yuwa muwayi ingirranggu, Jagara and Turrbal yani u. Balangarri wadjirragali jarra ningi – gamali ngindaji yau muwayi nyirrami ngarri thangani. Yaningi miya ngindaji Muwayi ingga winyira ngarragi thangani. Yathawarra, wilalawarra jalangurru ngarri guda. I stand here today on the lands of the Jagara and Turrbal People. There are many of us that have come from afar, we come speaking different languages, and we are strangers to these lands. The ear of this land is hearing our different languages and we reassure that we gather and talk together with good feeling. I would like to begin by acknowledging the Traditional Owners of the land upon which we meet, the Jagara and Turrbal peoples. I am a proud Bunuba woman from Fitzroy Crossing in Western Australia, and it gives me great pleasure to be here with you all to discuss this critical issue that impacts far too many Australians, and far too many of our peoples. I am all too familiar with the devastation that suicide wreaks on our communities. And it is a sad fact that, like many of you, I speak with firsthand experience of its terrible impacts on my own community. It is devastating that the Kimberley is going through its second inquest in as many years on this issue. I gave evidence in 2007 and I sincerely hope that this current process can lead to substantive changes that are so desperately needed. But I know that this is an issue that affects so many of our peoples across this nation, not just in my homelands. I address you today as the first Aboriginal woman appointed to the role of the Aboriginal and Torres Strait Islander Social Justice Commissioner at the Australian Human Rights Commission in 30 years. I look forward to bringing my experiences from living in community to this role and to elevating the voices of our people, throughout my term to address the various challenges facing our communities. I am proud to follow in the footsteps of my predecessors such as Mick Gooda and Tom Calma who have both been strong advocates on this issue and many others affecting our peoples for many years. People like Tom Calma and my fellow Western Australian, Professor Pat Dudgeon, have been fighting long and hard to make Governments sit up and take action on this national tragedy – particularly how it effects Australia’s First Peoples. I will reference their work in the Aboriginal and Torres Strait Islander Suicide Prevention Evaluation Project –in my remarks today. I am grateful for their leadership and point to their work to tackle the underlying issues of suicide for our people. But I am also grateful for the work of everyone in this room for what you are doing everyday to improve the lives of our people. We have all been touched by suicide in some way or another and together, I know that we have the best chance of bringing hope and change to our communities. But we know that we know that this is not an issue that we can tackle alone, that the causes are complex and demand responses that address the quality of life of our peoples. Over the next 30 minutes or so, I want to discuss the historical and societal conditions that lead to suicide and self-harm in Aboriginal and Torres Strait Islander communities. And then, drawing on my own experience in my community in Western Australia, look at the things we know can and must be done to reverse those conditions. 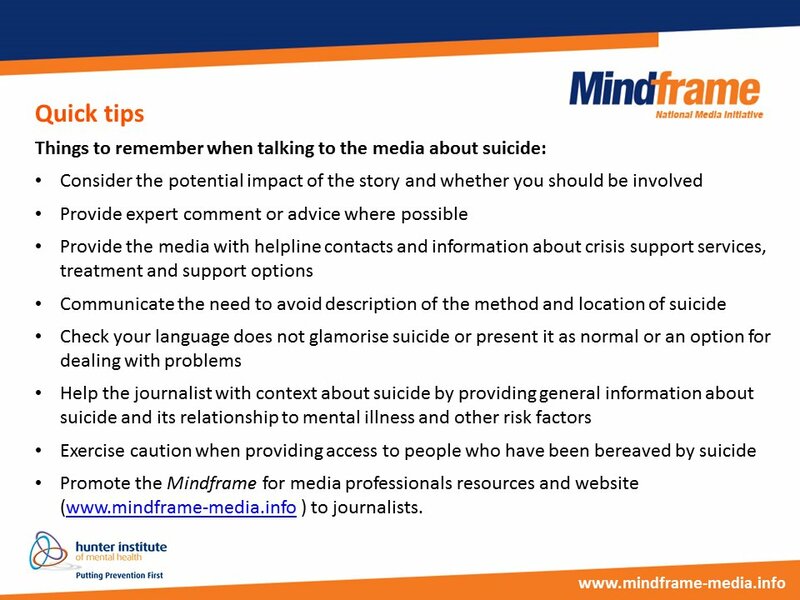 It is appropriate to highlight the need for a ‘Rights’ based approach in discussing suicide in Australia. We need to be clear about how a Rights-based framework is critical to understanding how to tackle the causes of suicide. These human rights frameworks are a critical starting point for all peoples. But for Aboriginal and Torres Strait Islander peoples, we know that the reality of our existence falls far, far short of these standards. We know that particularly in the remoter parts of the country that our peoples are living on top of each other and sometimes without the benefit of running water. We know the reality of some town camps where, cut off from basic services our people sleep outside, go hungry and struggle to keep warm. I saw similar conditions during my drive from my home in Fitzroy Crossing to take up my new role the city of Sydney. I travelled through many places across the country and saw our old people living in tin shacks far from essential services. These conditions are a breeding ground for suicide, self-harm and ill health to prosper. This reality jars against the image of Australia as a prosperous nation. Our country ranks as one of the richest OECD countries on earth and yet Aboriginal and Torres Strait Islander peoples do not sit at this table of wealth. We know that our nation’s prosperity and our people’s place amongst the most socially and economically disadvantaged are no coincidence. These events are inextricably linked. The colonization of our country has come at a great cost for our peoples. We see it everyday in the health and wellbeing of our peoples, in the lack of jobs and in the trauma and disadvantage that surrounds us. We see the cost in the eyes of our children who have come to expect this life of pain, of interaction with the care and justice systems, drugs, alcohol and little hope that things will change. The normalization of this despair is killing our people. We must all work harder to change the narrative of low expectations, that is set upon us by others and which we inherit, but we must also demand more from government. Our very survival in this country, is testament to our strength as a peoples and to our ability to adapt to our conditions. It is evidence of the strength of our culture which we know must be the bedrock of any solutions to many of the challenges that we face. We know that suicide speaks to our experience as Aboriginal and Torres Strait Islander peoples, as a peoples who are still grappling with our existence in a world that is very different from that of our ancestors. We must work to challenge the view that somehow our position in society is simply because of our failure or weakness as individuals. We know that much of our experience as First Peoples is a product of the past. Addressing the social disadvantage plaguing our communities is critical to solving many of the challenges facing our peoples, including suicide. It is critical to realizing the human rights of Aboriginal and Torres Strait Islander peoples. Our nation must face up to the devastation that has been wrought upon our peoples and which overwhelms us today. I have said before, that I will work to make sure that human rights are more than just words on a page for our people, but a part of our lived reality. I know that we have much work to do in order to be closer to that day. It would be easy to focus solely on the heartbreak that is suicide in our communities. We must give place to mourning and acknowledgement of those we have lost. But it is essential that we find ways to ensure that suicide is the rarest of tragedies in our communities. At a time when our peoples are faced by so many challenges, when our life expectancy is already significantly shorter than the non-Indigenous population, we cannot afford to have it shortened even further by suicide. The power of our culture in healing and the necessity of community designed and led solutions are key antidotes for change. I am encouraged by the theme of this conference – with the focus on Relationships, Resilience and Respect. These are key to our existence as Aboriginal and Torres Strait Islander people. Our culture is both an ancient and continuing source of resilience. And it is a necessary part of the solutions that we are forging in our communities right across this country. We know the healing power and protective role that culture plays in our communities. Our culture kept us safe and healthy long before the British arrived on our shores and long before we even had words to describe the devastation of suicide. It has been a reservoir of strength that has sustained us throughout time. Research tells us that strong cultural connections is a necessary ingredient for good health and wellbeing. Of course we already know this but we need to build the evidence base around what works. Our culture is the inspiration behind the therapeutic economies giving hope to our women in the Kimberley – who are creating new lives for themselves away from violence and drug dependence through making wearable art. Similar initiatives exist across the country and we are finding new and innovative ways to broach this difficult subject. I want to acknowledge the work of Walpiri elders for trying to find a way to reach and reconnect with their young people through the development of the Kurdiji App. I look forward to seeing what other creative solutions our people come up with to tackle this important issue. This is the cultural medicine that our people need. We know that culture is a critical ingredient of any approach for addressing suicide in our communities and is a lifeline to all of us but especially our most vulnerable. We also know that bringing about change means moving away from discussions that are based in the ‘deficit’ and channelling our efforts into the strengths-based programs and services such as those that I have already mentioned. The language of strength, not deficit is what will keep our cultures and our communities alive. I know that there will be plenty of facts provided at this conference about the size and nature of suicide, so I will just quickly run through a few details regarding suicide in our communities. It is still not well understood enough in the wider Australian community, why suicide and self-harm are so prolific among Aboriginal and Torres Strait Islander peoples. But for us we know this phenomenon is intimately linked to trauma. To borrow the term from Professor Colin Tatz, I think non-Indigenous people can sometimes suffer ‘wilful amnesia’ about the history of the First Peoples of this country and this means we are all left poorer for it. The impact of 200 plus years of colonisation, government policies resulting in dispossession, stolen generations and brutal assimilation have caused a level of trauma that passes from one generation to the next. Our children and grandchildren continue to suffer the terrible impact of the sufferings of their parents, grandparents and elders. The words of Richard Weston, are helpful in this context, he said earlier this year that: it’s not about trying to have a debate in this country about blame or guilt for non-Aboriginal people, it’s really just trying to understand how we got to where we are. A cycle of despair and the toll of intergenerational trauma are the conditions too many Aboriginal and Torres Strait Islander people live with. We know that a society that boldly acknowledges the wrongs of the past, and is determined to address those wrongs in the present will succeed in creating a stronger and safer place for Aboriginal and Torres Strait Islander people to prosper. 20 years ago, the Bringing them Home report told Australians and the world the truth of the Stolen Generations. It also told us something that we know all too well which is that – “trauma compounds trauma”. That Report further stated that: Trauma experienced in childhood becomes embedded in the personality and physical development of the child. Its effects, while diverse, may properly be described as ‘chronic’. These children are more likely to ‘choose’ trauma-prone living situations in adulthood and are particularly vulnerable to the ill-effects of later stressors. The cycle must be broken in order to stem the flow of suicide in our families and communities. We need to ensure that the conditions are right for healing. We know that the best way to achieve this is by addressing the social disadvantage I spoke of earlier, but also supporting Aboriginal and Torres Strait Islander families to create strong communities as the basis for healing. The best support structures begin with mentally and spiritually strong families, clans and communities. Sadly, we know that even the best, most connected, well serviced communities still have a huge challenge in addressing the needs of generational trauma. The reality is many Aboriginal and Torres Strait Islander communities are dealing with trauma in conditions that are unacceptable for non-Indigenous Australia. We know that with all the energy in being strong, that some of us succumb to the trauma around us. Far too many of our people and particularly our young people look to drugs and alcohol to numb their pain. This is an issue that is very close to my heart. One of the big challenges in our communities, with clear links to suicide and self-harm is the prevalence of Fetal Alcohol Spectrum Disorder or FASD. There are many symptoms and outcomes of intergenerational trauma but this is one of the most acute issues that I have experienced in community. After a series of tragic suicides in 2006 a coronial inquest examined why so many Kimberley Aboriginal people were taking their own lives. Not surprisingly it found that alcohol abuse was the primary reason for the suicide epidemic of Kimberley Aboriginal people. I have said before, that my own impossible dream was to bring about better life opportunities for the children in my community and town of Fitzroy Crossing. I know that like me, many of us see the pain that our people, carry around and we want to take that away. But sometimes wounds are so deep for cultural medicine alone to fix. After 50 deaths and attending too many funerals, I found it unacceptable that people I knew were dying in such high numbers from alcohol related preventable deaths. I knew that if we did not act, we would continue to see our families suffering and caught in a rut of grief and loss for years to come. Along with several other key leaders, we took an unprecedented step. With the support of our elders we lobbied the Director of Liquor Licensing seeking an initial 12 month moratorium on the sale of full strength take-away liquor across the Fitzroy valley. We were met with fierce resistance, especially from some members of our own community who were addicted to a destructive lifestyle, but we were unrelenting in what we knew was a necessity to break a circuit of chaos and grief. The restrictions have now been in place for nearly 10 years due to ongoing community support. Many who opposed our efforts are now thankful of the positive impacts that have become entrenched since the restrictions were put in place. Independent evaluations have shown some great results due to the restrictions; large reductions in alcohol related police interventions, large reductions in alcohol related presentations to hospital and an increase in school attendance. As a community, we started to change the conditions that incubate suicide and self-harm- but alcohol management is just one plank in the program of solutions that are needed. Let me be clear, while we have seen some amazing results in my home community in Fitzroy Crossing, alcohol restrictions have never been intended as a panacea. Alcohol management is just one part of an ongoing strategy for my community. We know that the support services that are desperately needed are often lacking in our communities if they exist at all. While there has been some good progress in Fitzroy Crossing, we still lose too many people, particularly our young people, to suicide. I am disheartened to hear that a decade on we are back again before another Coronial Inquiry. I despair, as I am sure many of you do, knowing that inquiries aren’t a substitute for action but remain hopeful that the findings might translate into meaningful change for our communities. Hard as it is, I know that we must continue to thrust the suicide epidemic that we are facing across the country into the spotlight. I thank the work of people like Professors Pat Dudgeon and Tom Calma for doing just this through the work of the Aboriginal and Torres Strait Islander Suicide Prevention Evaluation. We know from that report, as with all other issues affecting our communities, that approaches to suicide prevention must be community owned and led if they are to be successful. The Report recognises our holistic approach to health and articulates the connection between culture, healing, social determinants such as housing and education, and the generational impact of trauma. One of the keys to preventing suicide is to remove the siloed approach to all these issues and instead, consider them all together. Our community controlled services are at the forefront of providing holistic, wrap-around services that look at the entirety of need. Such approaches are a core part of the ongoing criticisms of how governments tend to organise their programs and services. When it comes to suicide prevention, we cannot afford to live with the chaos of disconnected programs and services. The Close the Gap Campaign, of which I am a member, has been calling on the Federal government to fund an Implementation Plan for the National Aboriginal and Torres Strait Islander Suicide Prevention Strategy. This Strategy has a holistic view of our mental, physical, cultural and spiritual health. It has an early intervention focus that works to build strong communities through more community-focused and integrated approaches to suicide prevention. A considered Implementation Plan with Government support is needed to genuinely engage with our communities, organisations and representative bodies to develop local, culturally appropriate strategies to identify and respond to those most at risk within our communities. A future Implementation Plan should begin with the recommendations of the Aboriginal and Torres Strait Islander Suicide Prevention Evaluation Project Report from last year. But there is a final point that I wish to make about this important issue and that is about the issue of place. Too many Aboriginal and Torres Strait Islander peoples do not feel at home in the place we call our own. We feel at unease at the ever increasing role of governments and other agents in our lives. Daily experiences of racism and disadvantage are the norm and eat away at our health and wellbeing. It is sad that we live in a world so desensitised to our trauma that 10 year olds committing suicide are met with expectation and not surprise. This is an indictment on our country. This is the story of Australia. Brick by brick, structures have been built on our ancestral homes, leaving little room for our cultural way of life. The challenge for us in the modern world is how do we continue to be sustained by the world’s oldest living culture in a society that seems to give it so little value. Walking in two worlds of what it means to be an Indigenous person in this country is not an easy path. Sadly, it is too easy to get swept up in the pain when you are surrounded by little else. We need to shift how Aboriginal and Torres Strait Islander peoples are able to participate in Australian society. We need structures, schools, safe spaces where we see ourselves reflected back to us, where we are respected, where we have the same opportunities as others, but also where our voices are heard. I don’t mean having a separate society for our peoples but one where we clearly see a place for ourselves and our children in what exists around us. This is what cultural security looks like. It is my hope that one day we won’t need conferences like these, and that our people will find a place in our country where they feel strong and supported and exist on equal footing with their fellow Australians. That day is yet to come but being in the presence of you all gives me great hope for the future.